All products can be shipped or picked up in our shop location at Independence Way, Brewster NY 10509. Washing machines are a leading source of the solids that plug drainfields. A typical family washing machine produces enough lint every year to carpet a living room floor! Lint screens and nylon socks trap less than 5% of these contaminates. These minute particles, because they are so small and light, do not settle in the septic tank, rather they stay in suspension and are flushed out to the drainfield where they actually plug-up the pores of the soil bed. To compound the problem much of our clothing and carpeting is now manufactured with synthetics, polyester, nylon etc… Septic systems do not breakdown plastics! Once these non-organic materials enter the drainfield, there is no way to remove them. These material fibers plug the pores of the soil bed. Material fibers also are a leading cause of plugged sewer pipes. Filters are $139.95, and are simple to install. Tank risers eliminate digging up your tank cleanout opening, saving time,and money. Available in 24″, and 18″ Risers can be easily cut to any height. 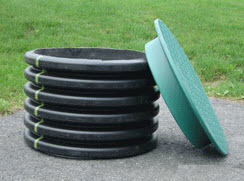 Plastic and concrete lids are available.